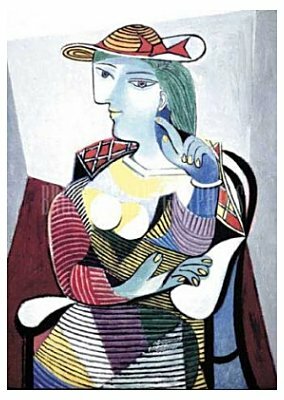 Picasso continued to create familiar and tranquil images of Marie-Therese until the end of the decade even though Dora Maar had gradually replaced her. In mirroring domestic realities he created these iconic images in which Marie-Therese on her armchair throne, was being challenged by Dora Maar, as if one playing card queen were conspiring against her rival. In this portrait Marie-Therese resumes the meditative pose of Ingres Madame Moitesier,, but this poise is threatened by the angular and cramping distortions of the box space in which she is caged. This point becomes clearer when you see this image in tandem with a portrait of Dora Maar (Seated)which also reflects the Ingresque head to hand posture but suddenly presides with authority in a centered rigid box space. This listing of artists is not official. It is merely intended to group the artists in an easy to navigate format.